It had been two years since our last RHATT tour; we considered several places to tour including Patagonia and Iceland, but we ultimately decided to return to Germany with the European airfares that were available at bargain rates and the dollar had a short lived rebound against the Euro. The plan was to visit Bavaria, a little of the former East and Berlin. We flew from Houston to Munich on KLM via Amsterdam. The flight left IAH on time at 3:30…we had the best economy seats on the plane…those at the exit so we had all the legroom possible with no one to lean back on us during the flight. The Dutch service was efficient and friendly…the meals were as one would expect in today’s economy. We had very favorable tail winds and arrived in Amsterdam one hour early…this gave us plenty of time to make our connection with an hour to spare in the KLM Crown Lounge. The continuation flight to Munich was barely an hour. We arrived about 10:30 in a slight drizzle with heavy overcast. We had to wait only a few minutes for our luggage and then we ventured out to find the Lufthansa bus for the 20-minute ride to the Nord Friedhof stop that was only 2 blocks from the Renaissance hotel. We had seen the hotel from the bus as it braked to a stop so finding our way back walking was no challenge. 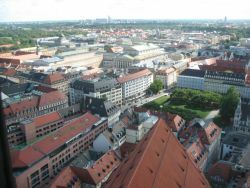 We were able to check in and drop the luggage, find the Tagelmann market for breakfast supplies and then discover the Munich Underground for a quick ride to the Chinese Tower in the Englischer Gartens for a visit to a bier garten. Unfortunately the bier garten was closed, but next door was a restaurant where we could relax and enjoy a glass of Hof Bräu. We knew we had about 1 hour and 30 minutes before Robin and Steve arrived so we didn’t have a lot of time to spend for beer at this stop but there would be ample time for more before the end of the day. We enjoyed our walk through the Englischer Gartens…this is one of the largest city parks in the world with miles of trails for walking and cycling and we saw plenty of locals doing just that. 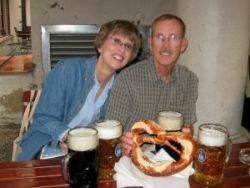 We did have to ask once for directions to the bier garten but we were never really far away. We arrived back at the Renaissance just as Steve and Robin were checking in. We met in the lobby 15 minutes later and took the subway to the Olympiazentrum to visit the BMW Welt and Museum. We were there a little over an hour and while we did enjoy the architecture, art, cars and exhibits, we were all feeling the effects of the sleepless night on the transatlantic flight. 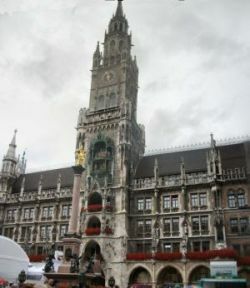 Our next stop was the Marienplatz to see the famous glockenspiel and we were there for the 6:00pm show…only problem was that was not a time when the marionettes performed their little spiel. So no problem…we walked 2 more blocks to the Hof Bräu Haus for a Mass (the Bavarian measure for a liter) of Bier and a Pretzel. This is enormous beer hall packed with guests and all are enjoying the oompah music and the giant beers. We tried both the dark and helles styles of the King’s brew. From there we walked across the street to the Augustiner Restaurant where we ordered traditional Bavarian meals. Robin got a plate of grilled mushrooms with a knodel, Steve had a grilled pork chop, Becky ordered the sausages with sour kraut and I ordered a Haxeteller which was a grilled pork knuckle. We were all feeling hungry and this meal was totally satisfying…did I mention that we each had a half liter of the Augustiner Bräu? Now satiated and exhausted, we rode the U-bahn back to the Renaissance for a much needed night’s sleep. Today is our 38th Wedding Anniversary. We started the morning with coffee and latte from the Mövenpick coffee shop.,we had elected not to take the breakfast option at the hotel primarily due to the expense. Instead we purchased fruit, yoghurt, bread and cheese at the local market. Steve and Robin joined us in our room for breakfast about 8:00; the breakfast plan worked very well and gave us the time to finalize the plans for the day. 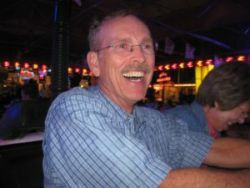 The first item on the agenda was to pick up the rent car which we had reserved and prepaid several months in advance. The rental office was across the street from the BMW world headquarters and we were confident that we could get there and back in short order; however we had not anticipated that the Münchener Freiheit U-bahn station would be closed for repairs and as the train ran through the station without stopping we quickly reviewed the route maps and realized that we would have to change three times before we could get where we needed to be. This was no problem…just took longer than anticipated. 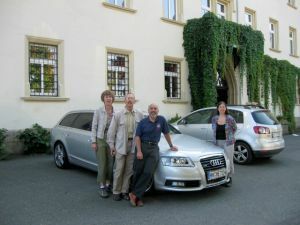 Once we arrived at the terminal we found the EuropaCar office where our new Audi A6 (diesel) station wagon was waiting for us. The car was terrific…loaded with options and no instruction manual…many of the features we never figured out, but we did manage all of the essentials. The drive back to the hotel was less than 5 minutes which only magnified the extra long route we had taken to get there by subway. After parking the car, we boarded the U-bahn for the Marien Platz to begin our tour of the Old City. We walked across the crowded square in front of the famous Rathaus with its Glockenspiel towards the Frauen Kirche; we peeked in the Nave where there was an English service in progress. We climbed the bell tower to the observation deck where we had the best available view of the city. We saw all of the places we had planned to visit and then continued on our tour. We walked to the Residenz which was the former home of the Bavarian royalty. This is a marvelous Palace which is completely restored following WWII. There are several pieces of original furnishings as well as exquisite examples of Bavarian craftsmanship in the wood and stonework. The audio tour that was included in the admission added detailed explanation of the 90 rooms we visited. Following this tour we were ready to find a place for lunch…plans called for a visit to the Victualmarkt that was a short walk. We found interesting places to eat in the market, but they were so crowded that we chose a nice Spaten restaurant across from the market…this turned out to be a fortunate selection…we each found something unique and delicious. The bruschetta that Robin selected was notably outstanding. The next stop was the Isartor for a impressive view of the main entrance to the old walled city. From there we strolled along Maximillian Strasse, gazing into the designer shops and gawking at the cars (Ferraris, Bentleys, Rolls convertibles, etc) parked along the curb. Our final stop was at the Dallmyer store behind the Rathaus for a walk through this famous upscale food market. 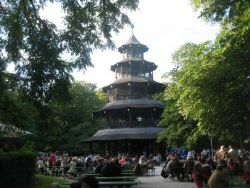 We did buy some pretzels for our next activity of the day…a visit to the Bier Garten at the Chinese Tower in the Englischer Gartens. We found the Bier Garten where there was a band playing music on one of the upper decks of the tower. We selected our beers and returned to the table to enjoy the weather, beer and German ambiance. Final stop of the day was a restaurant near the Frauen Kirche that feature typical German specialties. End of a wonderful day celebrating our anniversary. We planned an early departure out of Munich to avoid all the traffic congestion…. we accomplished that in spades with a 7:00AM checkout. 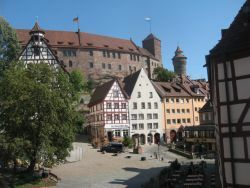 Our itinerary today was to drive the Romantic Road and visit the medieval cities of Nördlingen, Dinkelsbühl and Rothenburg ob der Tauber. Nördlingen was just a little over an hour away from our hotel and was our chosen location for breakfast. We found the Klostere hotel and enjoyed their breakfast buffet…then we took an hour to stroll the ramparts of the city walls and explore the streets and shops in the town. Nördlingen is almost a perfect circle with a completely restored wall and ramparts that circumvent the the town. Our next stop was 30 minutes away in Dinkelsbühl…like Nördlingen; this is a beautifully restored medieval city with a complete wall. We made a walking tour to see the beautifully flowered homes; we passed a shop selling original Rothenburg Schneeballen (snowballs). These are cookie pastries in the shape of a 3” diameter ball. As usual they look a lot better than they taste. 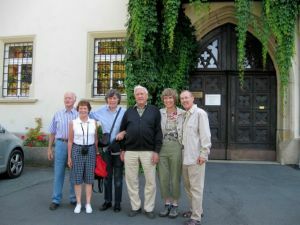 Final stop of the day was Rothenburg ob der Tauber, the largest of the three cities…this time our navigation system took us off the Romantic Road to the autobahn…Robin was driving and zipped us quickly to our accommodation for the night the Gästhaus Eberlein. We met Erich and Inge who were our hosts…they gave us a brief explanation of the city and how to navigate the town. We had a few minutes to enjoy a beer and check email before exploring the town. This weekend was the annual Renaissance Festival with street performers and exhibitions. 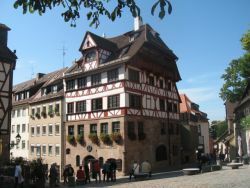 Rothenburg is the largest of the three medieval towns and therefore attracts more tourists. We had plenty of time to visit the important sights, walk the ramparts, stop and listen to the street performers and take a break at a wine bar to enjoy a bottle of Franken wine. I was trying to find some collector quality beer steins and we finally found a shop that featured hand made steins that were the style and colors that we were searching for. 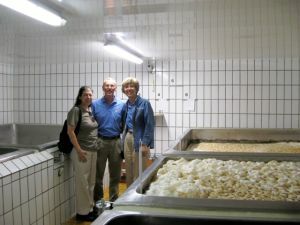 The hosts at our Gästhaus had recommended a restaurant, which specialized in potatoes dishes. This was a good recommendation and we really enjoyed the unique potato specialties. Becky’s niece (Jill) and her family (Robbie, Courtney, Cain and Sally Ann) met us at the restaurant and we had a couple of hours to catch up on their lives in Germany. Jill is an accountant who is working for the US Army near Wiesbaden. The day began with a sumptuous breakfast buffet at the Gästhaus Eberlein; we checked out and headed in the direction of Nurnburg which was less than 2 hours drive on the autobahn. The Tom-Tom directed us straight to the Alt Stadt…we had no trouble finding a parking garage and then we began our walking tour of the town. We found the tourist information office to get a free map and then plotted our tour. First stop was the house of Albrecht Durer, This was an excellent restoration of a 500-year-old house where the famous painter lived and worked. From there we went to the Nurnburg castle and then it was time to take a pause at a coffee shop for drinks and pastries. 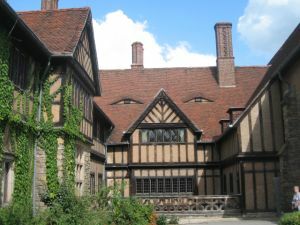 Next we toured the Tucher (the family from the Tucher brewery) mansion; then it was time to return to the parking garage and continue the drive to Regensburg. We took the autobahn directly to the beautifully restored Maximillian Hotel and checked into the spacious rooms of this 4-star hotel. 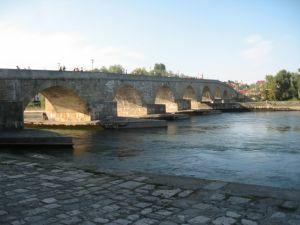 Regensburg was originally a Roman garrison on the banks of the Danube river. The 600-year-old Steinbrücker stands today as a constant reminder of the origins of the city. The tour guidebooks list Regensburg as one of the best preserved medieval cities in Western Europe…the old town is completely restored with modern shops and classic churches, but for me some of the quaintness we had experienced along the Romantic Road was missing. We did take a brief walk to the bridge and the famous Wurst Kitchen on the riverbanks next to the bridge. We were on the way to the Fall Folks Fest (Dult) which was across the Danube…this is the Regensburg equivalent of the Oktoberfest. 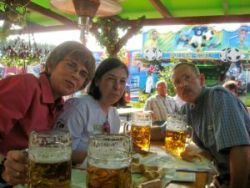 We had no trouble finding the festival grounds and immediately found a table in the Bischofshof brewery tent. We ordered 4 Masses of beer and joined in the timeless German tradition of good friends, good food, good beer and good times. 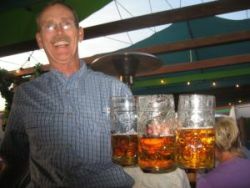 The Bavarian Band was playing the traditional oompah music and the beer maids were serving the huge glasses with as many as five in each hand. We started with a couple of huge pretzels with sliced cheese and later ordered dinner…Steve got a roasted chicken with potato salad while the rest of us ordered a grilled chicken breast salad. We were very pleasantly surprised at the quality of the food served in the beer tents. For us, the people watching was the attraction of the evening as crowds promenaded past our view, some were costumed in the traditional Bavarian Dirndls and leder hosen while others were dressed for the county fair. Some were in search of adventure and others merely content to see and be seen. We had a good vantage point to view several of the carnival rides and by the end of the second mass of beer we had decided that a ride on the bumper cars was a requirement. Fortified with beer, pretzels and food, we boldly stepped into the bumper cars for a couple of spins around the course, gleefully creating all possible havoc. The 15-minute walk from the festival grounds back to the hotel in the fresh evening air was welcomed and fitting end to an evening of debauchery. We began the day with a breakfast feast in the Maximillian dining room…truly this was one of the most opulent displays of every so rt of breakfast item. Not only was the presentation impressive, but the food was as good as it looked. We had reserved the remainder of the morning to tour the Regensburg old town; we started visiting a square that was the site of a former Jewish synagogue and strolled to the Alte Rathaus and tourist information office. Next we crossed the Steinbrücker for a fantastic view of the city and church spires. The weather this day was perfect which only amplified the magnificence of the city’s beauty. We stepped inside the Dom for a peek at the cathedral’s interior and then continued to the city museum where we took an audio tour of the Roman section of the museum where we learned much of the origins of this 600-year-old encampment on the Danube. At the end of the audio tour, we had only a few minutes before the check out time at the hotel and the end of our visit to Regensburg. After checking out of the hotel, we repacked the Audi and programmed the navigation systems to direct us to the Schloss at Oberkotzau. 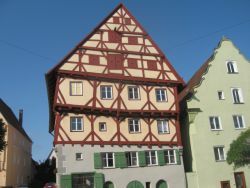 This is the home of Otto-Heinrich and Ute König who are friends of the Dege’s. At Conrad’s wedding last year, they had mentioned that they were living in a castle near Hof and that we were invited to stop by for a visit. We couldn’t miss the opportunity to overnight in a castle, so we made arrangements to include a day with them in our itinerary. Conrad (senior) and Inge joined us at the castle; he was waiting at the front door as we arrived Their home lies about 1 ½ hours away from Regensburg…we drove directly to the castle…well sort of directly except for the bridge that was closed for reconstruction, but Katy (the name of the voice on our Nav system) quickly rerouted us so that we still arrived as scheduled. We dropped our luggage in the vacation apartment of the castle and joined the Königs and Dege’s upstairs for coffee and cakes. The castle is at least 150 years old and is furnished with hunting trophies and impressive antique furniture. After we learned a bit about the history of the home, Otto-Heinrich drove us to the local brewery because I had mentioned that we were looking for souvenir brewery steins. The Stelzer brewery was only 2 kilometers distance away…the roads took us through active farmlands over one-lane roads. The brewery did have half liter 650 year commemorative steins for sale and as we were paying, Otto-Heinrich arranged a tour by the brew master. We began in the mash room where he explained the brewing process and the styles of beer he brews there. Next we entered the fermentation rooms with pungent aromas from the fermenting process. Next he led us into the lager rooms where the beer would age for a prescribed length pending its type. Following the tour we purchased a case of Schloss Pils that I assume was named after the castle where we were staying. Back at the castle, everyone was waiting to take us to the Hof city park for a walk in the gardens. When we returned, we had about a half hour before the dinner…time enough to enjoy a bottle of the beer we had purchased earlier at the brewery. The dining room in the castle is enormous…we were comfortably seated around a table that could be expanded to seat forty. Dinner was typical German evening fare consisting of salads, cold meats, cheese and bread. The conversation was robust and buoyant as Otto-Heinrich had started the event with a toast of homemade cherry schnapps. There was flowing wine and beer to accompany the meal. Following the meal we retired to our accommodations for the evening. The Königs had set the breakfast time for 9:00AM this morning…after a good night’s sleep we all gathered in the great dining room for a typical German breakfast with the exception that Ute had made a platter of seasoned scrambled eggs…the first I had seen in Germany and they were excellent! There was some discussion about plans for the remainder of the morning; they had first suggested that we visit the tallest viaduct in Europe over the Göltzschau valley, but then thought we might prefer to visit a small border town which had been divided with a wall during the DDR time. We agreed this would be an interesting visit and thus drove the 15 minutes to the site of Mödlareuth…this town of only 50 inhabitants became the poster child for the East and West division and even took on the nickname of Little Berlin because it was the only other town to have a concrete wall dividing the population. We visited the exhibitions and saw a brief film of the history before it was time to bid farewell to the Deges and the Königs. They had an appointment with a prospective renter and we had 2 hours to drive to Dresden. They had recommended that we stop at the Göltzschtalbrucke because it was just off the autobahn. We did find the exit and the directions to the bridge were well sign posted and in a few minutes we arrived at this gigantic 4 tiered arched railroad bridge over the Göltzschau valley. From here we had about an hour to continue to Dresden…Katy directed us right to the Rothenburger Hof where we unpacked the car and checked into our rooms. We found the number 11 streetcar for the 10-minute ride to the historical center of town. We took a quick stroll through the Zwinger and onto the platz surrounding he Frauenkirche. We found the small pedestrian alley (gasse) leading to the terrace above the Elbe River. This passage is lined with bars and restaurants…we chose the Ayers Rock and sat at a comfortable table overlooking the street and the parade of tourists passing by. We were waiting for Conrad and Diane to arrive from Gölitz to join us for the evening. 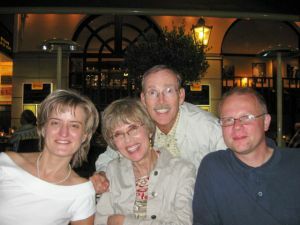 Conrad had driven from Prague after work and Diane took the train…they arrived about 30 minutes after we did. We spent the remainder of the evening catching up on the last year while enjoying dinner and drinks. After dinner, Conrad led us on a walking tour through the shopping district to a coffee shop where we stopped for coffee. Then we walked back to the transportation center to catch our streetcar back to the hotel and to get some rest after such a full day. The breakfast at the Rotherburger Hof was as good as we had seen on the trip…we grazed through the selections knowing this would probably be our last meal until evening. 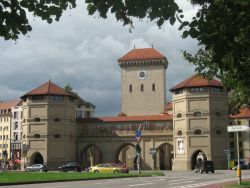 Next, we checked out of the hotel and loaded the Audi and drove to a parking place in the old town behind the Zwinger. 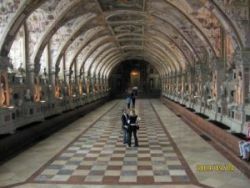 Our tour started with a visit to the Residenz which is now a treasury of art pieces from the former inhabitants of the palace. Of course it was destroyed during the bombing so we were visiting a reconstruction…somehow they managed to hide the treasures from destruction and pilferage and are now marvelously displayed…including world’s largest green diamond. 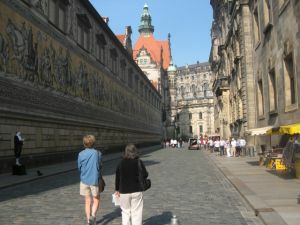 From the Residenz, we walked across the street to the cathedral and then along the terrace overlooking the Elbe River. 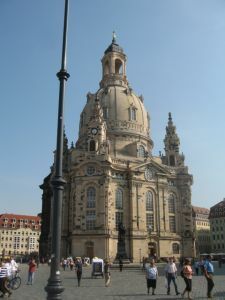 Our next stop was the Frauen Kirche; Robin and Steve took the tour up to the cupola, we had been there earlier with Conrad and Diane. 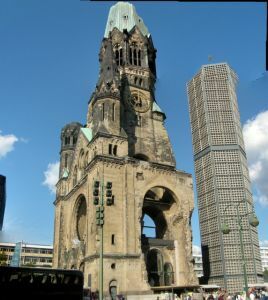 We then went to the City Museum that turned out to be one of the more interesting sights of the day with its history of the city and a particularly interesting exhibition of the reconstruction of the Frauen Kirche. Later we walked to the new Synagogue which was opened in 2001 and finally back to the car along the banks of the river in front of the Operahaus and back through the Zwinger. We settled comfortably into the Audi after having just spent 5 hours walking and touring museums and monuments. 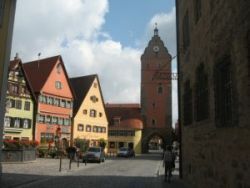 Robin drove the short 2-hour drive on the autobahn to the Marriott hotel. After check in, our mission was to find an ATM machine and a place to enjoy a beer and something to eat. Both were within a short walking distance…we stopped into a restaurant on Alte Potsdamer Strasse that is lined with a variety of eateries. 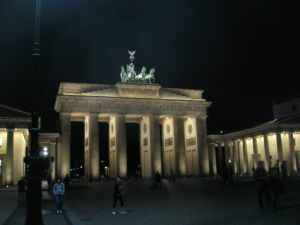 Following dinner and a couple of refreshing beers, we decided to walk the short 10-minute distance to the Brandenburg Gate. Under a beautiful moon, we walked along the route of the former Berlin Wall to the portal which symbolized the separation of East and West. We continued on the Unter der Linden Boulevard for a few minutes trying to recognize the changes, but the restoration has been so meticulously accomplished that it is impossible to see any remains of the divided city. We returned to the Marriott for traditional whisky and chocolates and then off to bed. Breakfast was not included in our rooms and with the price of an American breakfast hovering at $50, we elected to visit a nearby coffee shop. We completed our plans to drive to Potsdam to see the Sanssouci Palace, the gardens, Cecilienhof and the Haus am Wann See Konference. 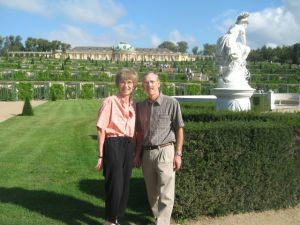 Sanssouci was the summer palace of Friedrich the Great,; we chose to visit only the gardens which are beautifully maintained. From there we drove to the Gruen Wald and the House where the Wannsee Protocol was written for the Nazi reorganization of Germany. Next on the agenda was Cecilienhof where the Allied Partners sat around a round conference table to divide Germany into four occupied zones for the purpose of preventing any possible reoccurrence of the circumstances that led to WWII. This was a great tour and well worth the visit…we then stopped for lunch at the courtyard café at the Cecilienhof and next drove back to the Marriott in Berlin. 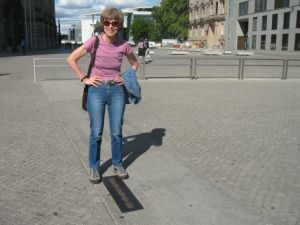 We still had a few hours of daylight so we walked about 15 minutes to Friedrickstrasse to visit Checkpoint Charlie and the 70 meters of the wall that remains as a monument to former divisions. Our next stop on the walking tour was the Gendarmplatz with its restored churches and concert hall. By now it was time for a visit to the Löwenbräu restaurant for a “halber” (1/2 liter). The remainder of the walking tour took us along the Unter den Linden Boulevard where we tried to decide which building were new and which were restorations. The final stop of the day was an outside table at the restaurant of 100 beers on the Alte Potsdamer Strasse…there was an excellent selection of European brews and the menu was well paired for the beverages. The first order of the day after breakfast was to return the rented Audi A6 back to the EuropaCar office at Alexander Platz…the office was only 1.5 miles away and there was virtually no traffic on Saturday morning, but the construction in the area made a challenging exercise to return the car. On our second drive by we spotted the entrance to the office…returning formalities were a breeze and soon Steve and I were on the U-bahn back to Potsdamer Platz. Becky and Robin joined us at the Marriott; we had planned to spend the day on a city tour where we could stop off at venues of interest and then hop back on the next bus to pass by. Our first stop was the Jewish Museum…a highly worthwhile visit…unfortunately there was much more to see than our schedule would permit as we had selected several stops to visit. We enjoyed to the English audio guide as we rode through the city in an open top bus. 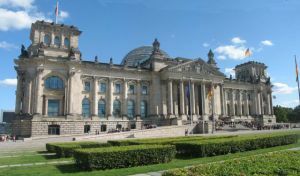 We visited the Berliner DOM and the Museum Island and then the Reichstag Building, Brandenburg Gate and Government building complex. Next stop was the Charolottenburg Palace for a walk through the gardens and then back on the bus to the Kurfustendam. This busy street became the heart to the West and is still a vibrant street lined with designer shops and department stores. We stopped into a beverage store because we had not tried any German wines on this trip; there was a bottle of Späteburgunder which looked OK and for the price we couldn’t resist. We continued strolling the Ku’dam until we happened upon a Platz with a pizza restaurant with an outdoor beer garden. After a slice of pizza and a glass of Pils, we were ready to continue our walk back to the Marriott, which turned out to be almost a 30-minute hike. We opened the bottle of wine for our aperitif and then went to the Linderbräu Restaurant in the Sony Center for dinner. This was a restaurant with an on site brewery; apparently very popular from the number of patrons. Their specialty beer was wheat beer, but not being a fan of this type of beer we selected the house Pils…it was OK but we had enjoyed others more. The menu was good and we enjoyed the evening trying to recall all that we had seen for the past week. Finally it was time to return to the hotel to pack for the last late session of whisky and chocolates before packing for the return flight home on Sunday.